Jim O’Neal is a man I would love to sit and have a beer and a chat with, after a day riding motorbikes of course! Jim is the man behind the O’Neal brand and Ae7 has been selling his helmets, body armour & clothing for a number of years now. Initially I knew nothing about the man behind the business however as the years have went past I’ve noticed his name appearing in different places and read quite a few articles about him. He is an interesting character with a real passion for his sport. The fact he turned his passion into a successful business puts him up there with a group of entrepreneurs whom I admire. Jim O’Neal is now in his late 60’s and he still rides motorbikes every week, nowadays with his sons & grandsons. He takes part in the Baja 500 off road race in Mexico every year. I was working a few years back with another great guy, the travel show host, writer and tv star Anthony Bourdain. The show No Reservations was being filmed in the Baja California area of Mexico. Whilst in the town of Ensenada (where the Baja races start & finish) we were lucky enough to hang out with a group of locals who were big into off road motorcycling and I spent a good part of the day riding motorbikes along the beaches and sand dunes nearby (working of course!). I later read that Jim O’Neal races here every year and he holds the record for the most stage wins, 14 to date according to score international. So what’s his story? Well basically Jim grew up in California, in the San Fernando Valley. He got into motorbikes as a teenager and began racing in the 60’s just as motocross began to boom in the United States. In 1970 he began to sell tyres and parts at the races and he launched his first product which was a front fender known as the “Preston Petty Fender”. This was the beginning of the O’Neal business that 45 years later is an international company with interests in MX and Mountain Biking. Jim’s sons helped to push the cycling side of the business in the 1980’s and these days O’Neal has a massive range of products and a growing number of brands that include O’Neal, Azonic, Blur Optics, Four & Rockhard Helmets. Nowadays O’Neal has a 67,000 square foot facility in the US and sales distributors around the world. In 1970 Jim had his van! 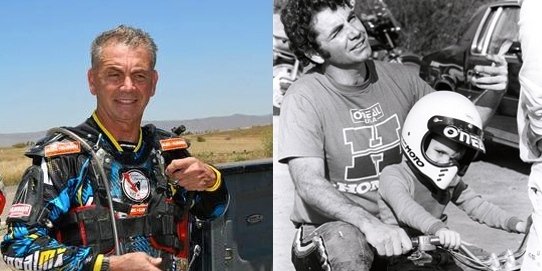 Jim still uses Baja and local races to test out new gear. A lot of the products that O’Neal sell have been getting thrashed on the race circuit for a couple of years before they make it into production for selling to the public. On the business side of O’Neal, Jim was clever enough to take on partners at key times to help develop the growth of products & sales and he’s seen exceptional growth over the last 10 – 15 years around the world. There are a lot of strong brands out there but sometimes the stories behind these don’t always get told. Jim O’Neal’s passion for quality and his principle to “create the best possible products for riding and racing in the dirt” has stood his company well. Here at Ae7 we share his passion and love the products O’Neal continue to create. 2014 is going to be an interesting year for O’Neal. New technologies & designs have made the latest range of O’Neal goods stand out and we’re very excited about showing you all the latest gear! Watch this space. Jim, a beer awaits when you have time for a chat (and a blast on the motorbikes of course!). This entry was posted in Business Chat, O'Neal and tagged Ae7, Anthony Bourdain, armour, Baja 500, beer, clothing, Helmets, Jim O'Neal, Mexico, motorbikes, mountain biking, No Reservations, O'Neal. Bookmark the permalink.